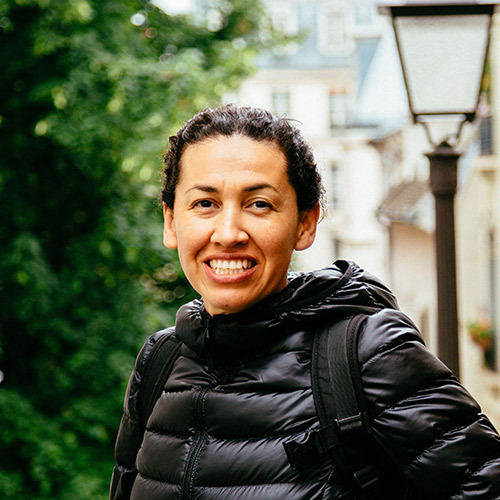 Originally from Michoacán, Mexico, Maria Victoria Ponce is a San Francisco Bay Area film director/writer who grew up in Richmond, California. She appreciates the complexity in the routine lives within poor and working-class neighborhoods, and themes of sexuality and coming of age tend to recur in her work. Maria Victoria is a NALIP Latino Media Market fellow and a Latino Screenwriting Project fellow. She is currently developing her first feature-length film as an artist resident at SFFILM FilmHouse in San Francisco. Maria Victoria wrote and directed the short film Mago, an official selection of the Los Angeles Latino International Film Festival, HBO/New York International Latino Film Festival, and Los Angeles Women’s International Film Festival. She also directed and produced the documentary Engage Her, interviewing civil rights leaders Dolores Huerta and Aileen Hernandez and Voto Latino founder María Teresa Kumar, among others. She recently wrote and directed the short film Lil Esmi, which premiered at the San Diego Latino Film Festival. Her latest projects include writing the feature-length script Hella Aquanet and writing and directing her short film Ruda, now in post-production. Washing Elena — A Mexican-American woman’s best friend is killed in a hate crime after she converts to Islam.